Amankila, which means “peaceful hill” in Sanskrit, is built along the contours of an escarpment be-tween two headlands in Eastern Bali. 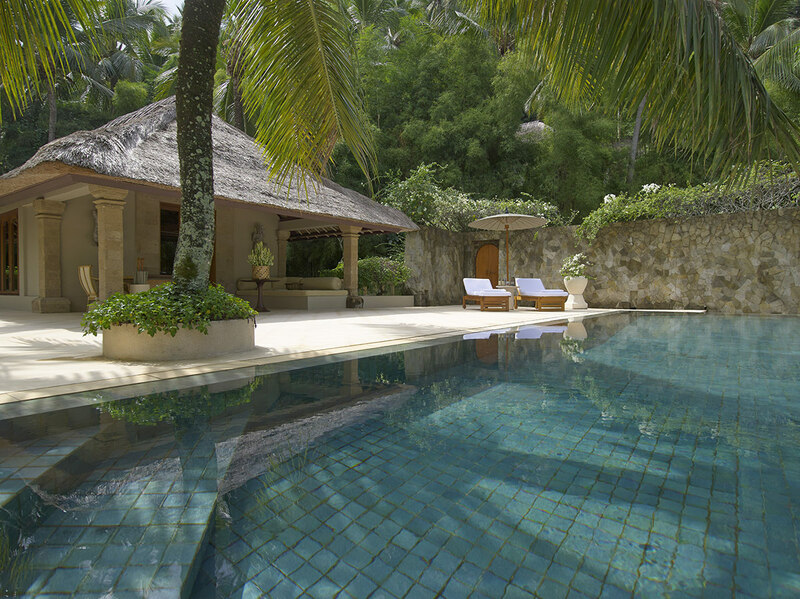 Located near the villages of Candi Dasa and Padang Bai, the estate set in 11 hectare – should be 6 hectare, remove wind surfing – provides a beach getaway in surroundings of heritage serene elegance. 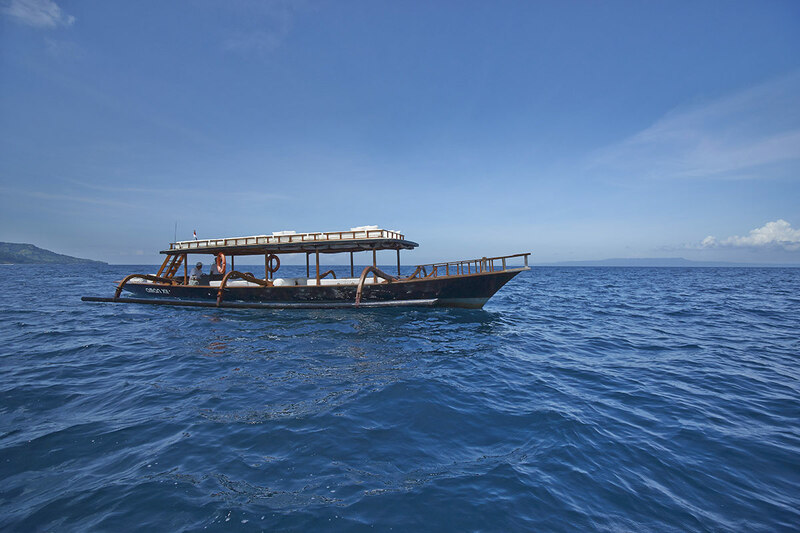 From here, guests have an opportunity to explore the rich Balinese prevalent in this preserved cultural and historical area that is East Bali as well as enjoying swimming, cruising and snorkeling. The estate’s main building consists of three levels. On the uppermost level is the arrival court and Lobby. One level below is the Bar and Restaurant. The Library, Gallery, Shop and Terrace Restaurant are all on the third level. 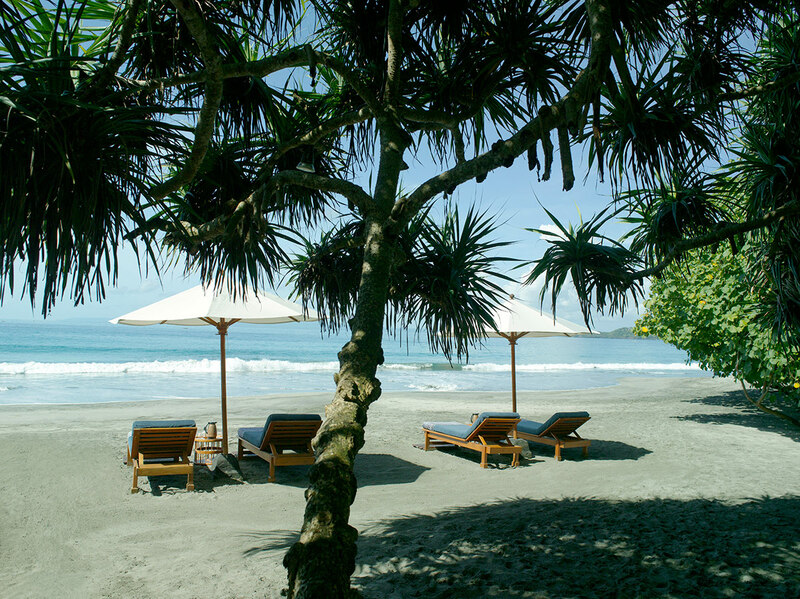 All public areas command spectacular ocean views across the Lombok and Badung Straits. The main swimming pool is terraced through three levels decreasing in size while ap-pearing to descend into the ocean. Steps from the central area descend to the Beach Club, set within a coconut grove on the beach. The club has an informal restaurant, a 41 meter swimming pool and a beautiful secluded beach with lounging bales and sun beds. Hobbie cats, boogie boards, wind-surfers and kayaks are available at the beach. None. We have on going maintenance for guest room and also all public area. 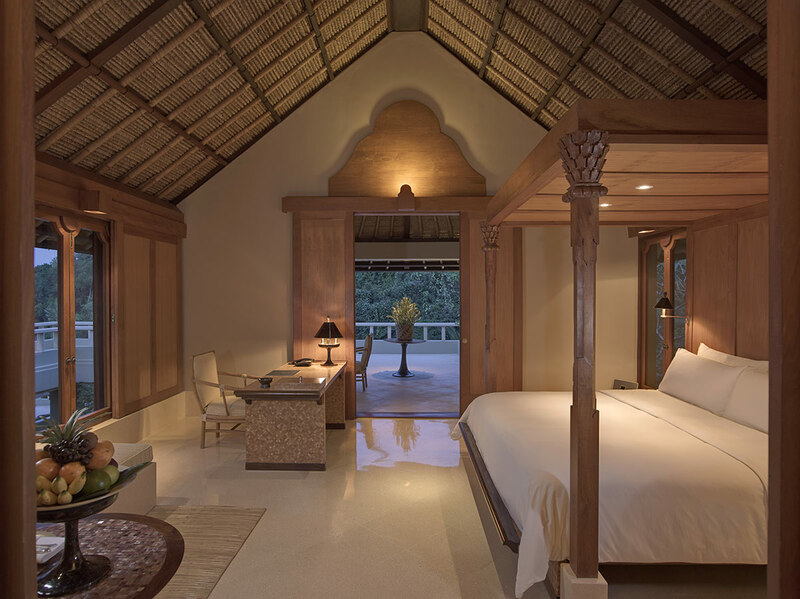 Balinese free standing luxury suites, elevated to take advantage of scenic views, combine the grace of traditional Balinese material with the elegance of terrazzo, timber and mirrored glass. 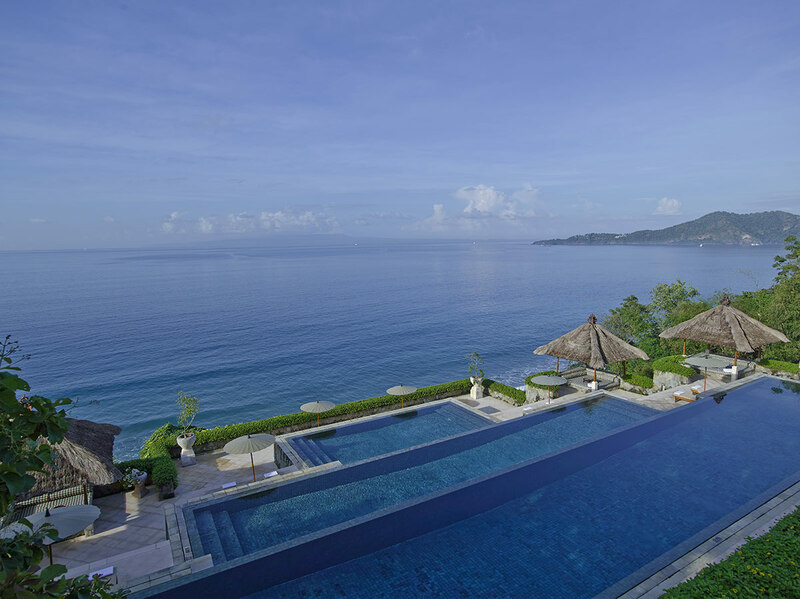 Amankila (peaceful hill) is a cliff-side beach resort overlooking the Lombok Strait in East Bali. 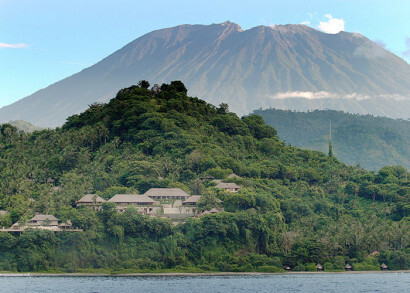 The resort is close to Manggis, Candi Dasa, Tenganan and other villages in Karangasem, Bali’s most traditional regency. 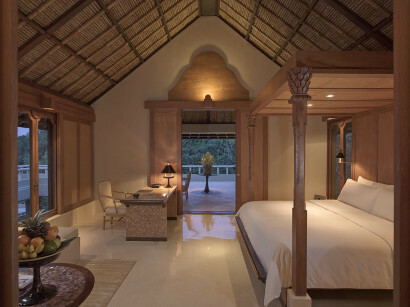 Most suites are elevated to take advantage of the spectacular views of the sea and coastline. From the International airport in Denpasar, Amankila is a 1 1/2-hour drive. Feature a large bedroom with wide window views, a canopied king-size bed and a writing desk. The bathroom is divided with a window-side divan, a soaking tub, separate shower and toilet rooms which give way to dressing areas with double vanities. 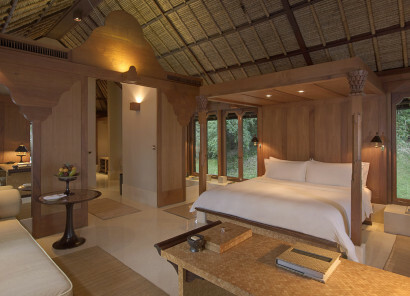 The suite’s outdoor terrace is furnished with a daybed, coconut-shell table and rattan chairs. Garden Suites have Garden views, Ocean Suites offer ocean views. Feature a large bedroom with wide window views, a canopied king-size bed and a writing desk. 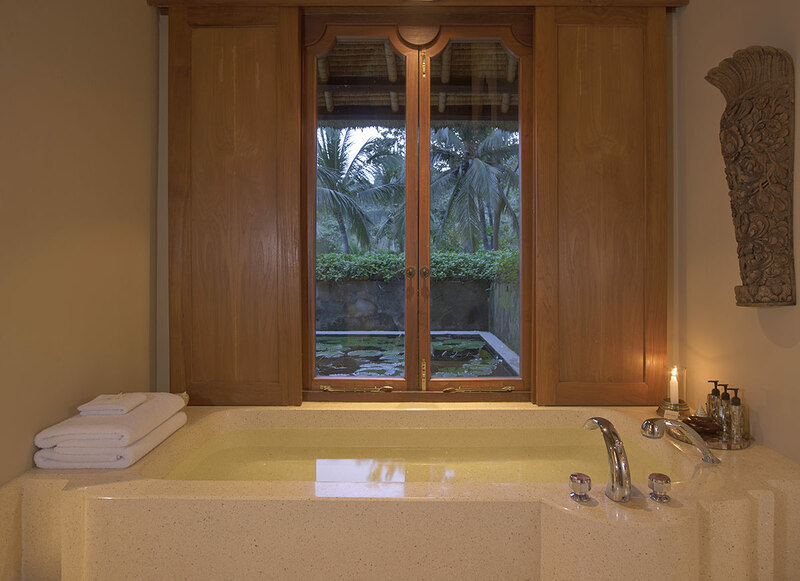 The bathroom is divided with a window-side divan, a soaking tub, separate shower and toilet rooms which give way to dressing areas with double vanities. The suite’s outdoor terrace is furnished with a daybed, coconut-shell table and rattan chairs. Garden Suites have Garden views, Ocean Suites offer ocean views. Pool Suites (6): Feature private pools enclosed within walls, three of which can be connected to deluxe suites and one to a superior suite if a family or group of friends wishes to have more privacy. 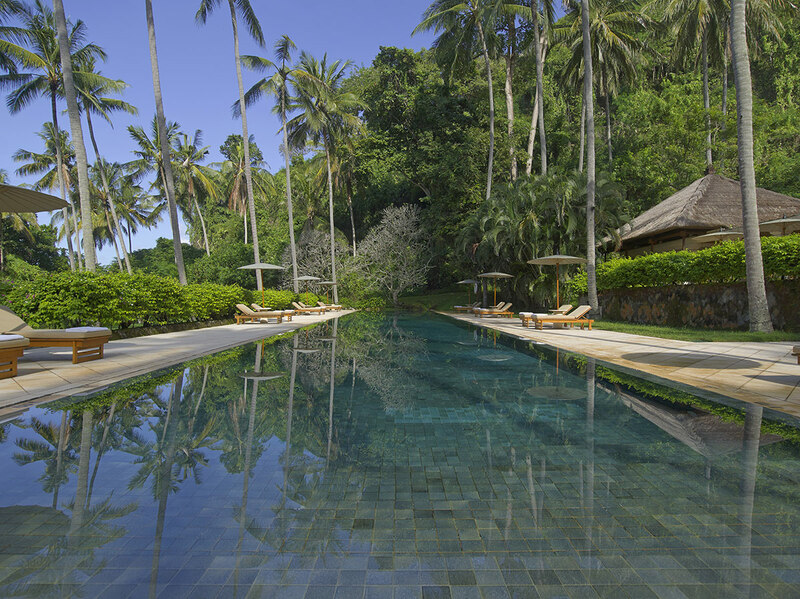 Takes its name from Amankila’s main temple, is perched high on the hillside, with views overlooking the sea and its own 12-metre infinity pool. 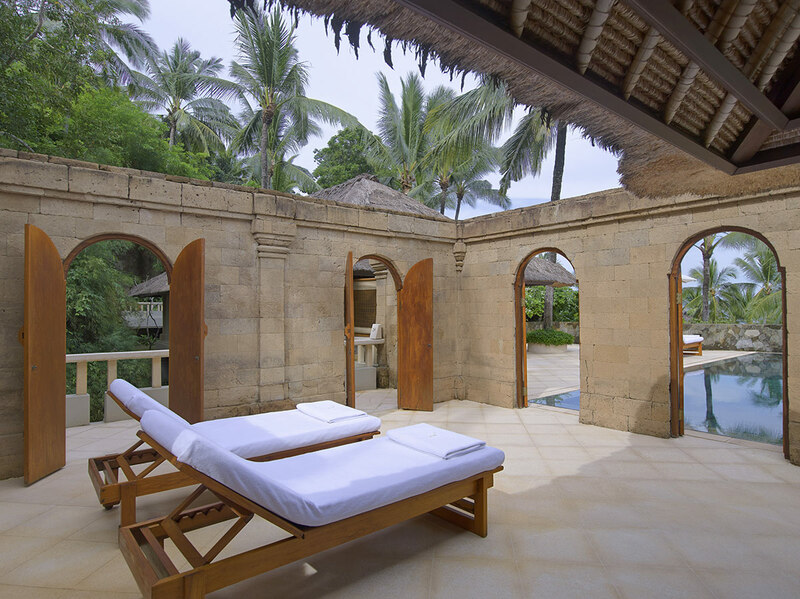 Includes two separate pavilions opening onto a large terrace with a private aquamarine-tile pool, two lounging bales, sun beds, lily ponds, limitless views over the beach and Amuk bay with private butler service. It is ideal for guests who want complete privacy or for two couples who wish to stay together. Pavilion with a private swimming pool, and walled privacy, spacious outdoor terrace with day bed and coconut shell dining table with rattan chairs, two sun beds, lily pond, large bedroom with canopied king sized bed, writing desk and ipod with bose docking station, spacious terrazzo bathroom with deep soaking tub, shower and window sized divan and double vanities with twin coconut wood dressing areas. 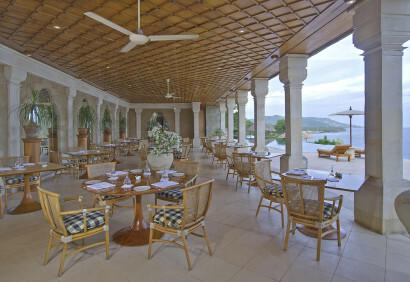 The Restaurant, located above the main pool overlooking the ocean, is open for dinner. The menu features both Western and Indonesian cuisines. Adjacent is Amankila’s Bar, also offering views out to sea. The Terrace, set back from the signature three-tier pool, is open for breakfast and lunch, and serves a selection of Asian and Western fare. A simple menu of salads and pizzas along with Indonesian and light Western dishes are served at the Beach Club for brunch, lunch, and afternoon tea. Indonesian ginger tea, Bali kopi and traditional Balinese cakes are served every afternoon by local women dressed in sarongs and kebayas from the steps in front of the Library. Private dining in-suite is available 24 hours a day. Besides the 41-metre Beach Club pool, Amankila offers a signature three-tier pool below the entrance pavilion. Each tier provides spectacular panoramic ocean views and bales for shade and privacy. Set into the cliff edge, the greentiled pools flow one into the other down a stepped gradient, mimicking the regency’s terraced rice fields. 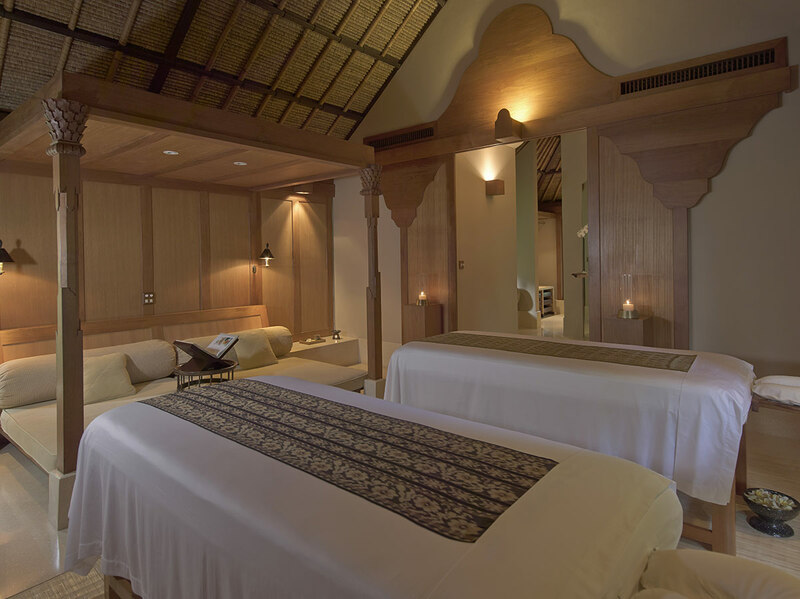 Traditional Balinese massage and beauty treatments are available in the privacy of guest suites, in the specially designated Massage Pavilion or at the Beach Club. Yoga classes can be taken amongst the coconut trees surrounding the Beach Club or in-suite. This is equipped with a treadmill, elliptical trainer and free weights. There are a number of spectacular settings for wedding at Amankila, the beauty of our natural peak overlooking both rice fields and the sea. For example, the Beach Club, nestled between coconut trees and a few footsteps from the private beach. 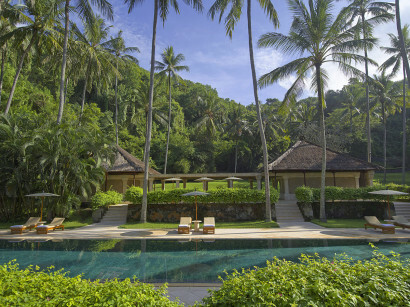 A natural aisle laden with flowers by local Balinese girls and the guests will be sitting on white coloured benches under the shade of the coconut palms. Candles will light the path if you choose a dusk wedding. Other options include the privacy of your suite, from intimate to larger spaces. Numerous dining options are available for your wedding at Amankila and menus can be tailor made with our Executive Chef. Our resident yoga instructor will conduct private yoga classes, either in your suite or down on the green lawn at the beach club amongst the coconut trees. Here you can experience our yoga instructor’s class with the sound of the waves in the background. During your stay at the Amankila why not join our local dive company for a day under the water! They offer daily dive trips for certified divers, introductory dives, PADI courses, snorkel trips, bubble maker program (diving for children from 8 years) and diving for seniors. Indonesia has the largest amount of fish and coral species in the world and Bali is no exception. They have a custom designed dive boat with a very experienced crew. An exhilarating rafting excursion on the Telaga Waja river in Karangasem challenges the brave at heart. Classified as a class IV river (class III being the easiest) the trip starts in Muncan and takes on rapids down a gentle gradient towards the coast. The excursion includes refreshments, snacks and lunch, transfers in an Amankila car and insurance. The excursion takes approximately one full day. Learn the flavors and traditional cooking methods of Indonesia, with cooking classes lead by one of our East Balinese sous chefs right here at Amankila. The cooking school is unique in that the our chefs have learned their skills from their mothers and grandmothers and their traditional family recipes have been handed down through the generations , as we are located in one of the most traditional regencies of Bali , these recipes still remain uncorrupted by time. Our cooking school offers an intimate hand on approach where you are given your own station and will be making the dishes from beginning to end, in order to get a proper insight of how Indonesian food is prepared and cooked -staples like mie goreng, satays, Indonesian spice pastes, and curies for you to replicate at home.